What to Do If You Forgot Encrypt iPhone Backup Password? What is the Default Password for iTunes Backup? I forgot my iPhone backup password, how can i recover it? Please help, your suggestions are greatly appreciated. Thanks! Nothing is more frustrating than forgetting encrypt iPhone backup password when you plan to restore your iPhone. iPhone users reflect in several ways to get themselves out of the messy situation, unfortunately, all the techniques used proved abortive. Perhaps you're among them , count yourself lucky to be here. We understand how you've been craving for a lasting solution to iPhone backup password recovery. While your knowledge on this issue is a bit limited, we enjoin you to spare some minutes on your journal to learn the amazing iTunes backup password recovery techniques that prosper in all situations. I'm telling you, these methods are worth checking out. After you've found a solution to this challenge through our techniques, you will surely don your cap for us. Forgot Encrypt iPhone Backup Password? Here Are the Solutions! iTunes backup password removal tools are bliss when trying to find iPhone backup password. Using these tools are the proven technique for retrieving forgotten iPhone backup password. iMyFone KeyGenius is one of these tools. iMyFone KeyGenius makes use of an advanced algorithm which can quickly analyze the backup encryption process and discover the correct password with a very high degree of accuracy. Below are the features of iMyFone KeyGenius. Unlock iTunes Backup: decrypt iTunes backup password with the latest decryption technique. Remove Backup Encrption Settings: turn off "Encrypt iPhone backup" option without password. 100% Safe: Won't do any damage to the data of your iTunes backup and iOS device. Compatible with all versions of iOS and iTunes, including iOS 12 and iTunes 12.9.
iMyFone KeyGenius provides a very easy to follow iTunes backup password unlock process: Simply follow the underlisted steps to retrieve your iTunes Backup password. Select Unlock iTunes Backup option. Next, all iTunes backups on this computer will be listed, select the one you want to find its password and click on the Next button. 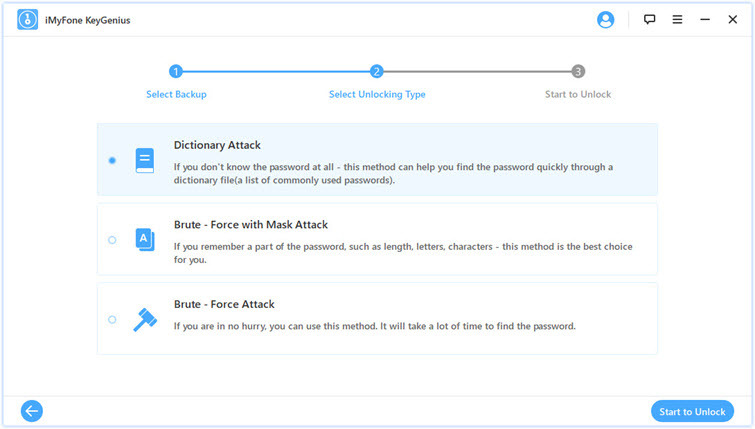 There are 3 types of attacks on the interface, namely Dictionary Attack, Brute-force with Mask Attack and Brute-force Attack. Choose the most appropriate one to effectively retrieve your iTunes backup file password. Next, click on the Start to Unlock button for iMyFone KeyGenius to start finding the password. During the decryption process, you can tap on the Pause button if you have an emergency to deal with. When you are back, you can continue the decryption process. 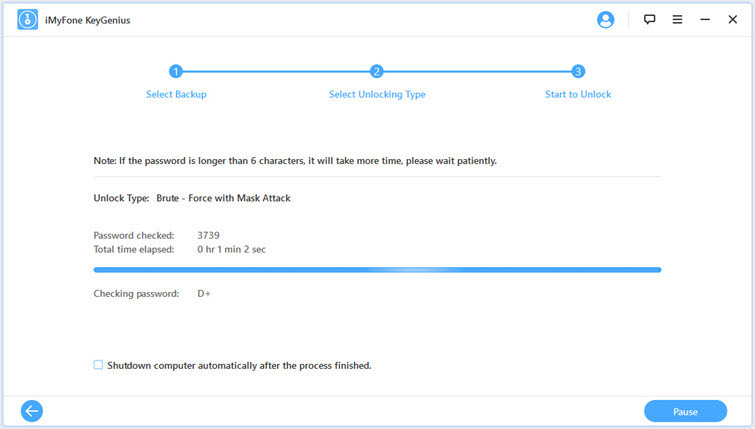 It should also be noted that the unlock time depends on the password length, complexity and attack settings. Generally, password under 4 digits are easily discovered. The longer your password is, the more time it would take. If you can resist a shred of doubt in your mind and allow a quiet confidence within you, it's possible to have a distinct privilege of getting back your forgotten encrypt iPhone backup password. Sure, it seems to be counter-intuitive, but it has worked for several iPhone users. Judging from the meditative pause of several users, it's believed that passwords are keywords commonly used by several individuals; a combination of strings means several things to people. So relax your mind and try the likely character combination you can remember. Don't be surprised that the right key comes unconsciously. Here comes the second method on how to find encrypted iPhone backup password. This method works for those who have gone a bit overboard with the unlocking scenario. You can do funky stuff during this moment only if you've done iCloud backup that has the data you desire to restore. Through this , it's possible to restore your iPhone from iCloud backup to replace iTunes backup. To retrieve your data through this technique, your phone must have backup the data before the incidence. 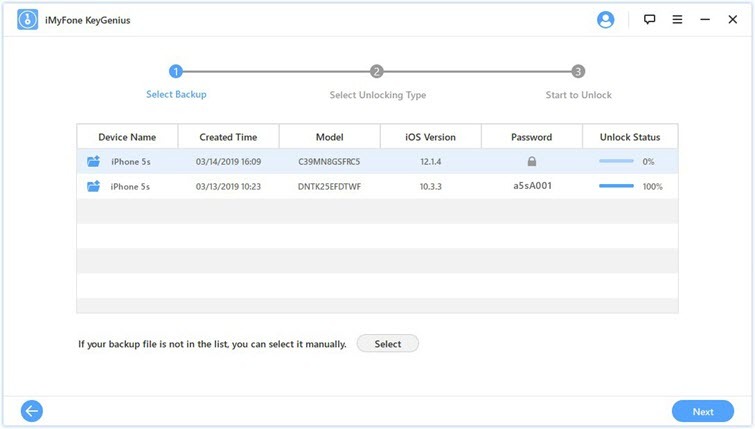 You can be sure of restoring your iPhone from iCloud backup if that framework has been implemented earlier before the scenario. Step 2. Enter the required iOS password. Step 3. Follow the screen instructions to reset your setting. Be aware that this action doesn't have any negative effect on your user-data or passwords. That doesn't stop the fact that settings like wallpaper, home screen layout etc. won't reset. Furthermore, the action will remove your encrypted backup password. Step 4. 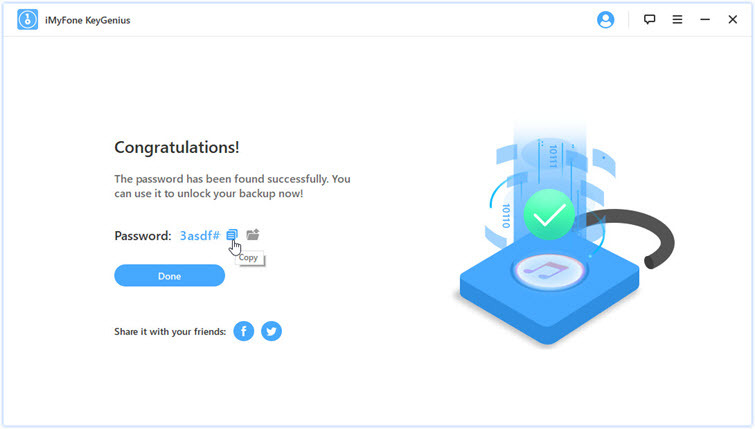 Connect your device to iTunes again and create a new encrypted backup. Note that previous encrypted backups will be useless. You can only back up your new data with iTunes and reset iPhone backup password. iMyFone TunesMate offers iOS users the best solution for their devices. It has provided solutions for over 2million clients in various parts of the world. Backup & Restore iOS Media Files - This app permits you to easily and freely transfer iOS media files - music/videos/ photos from iPhone to iTunes/computer and vice versa. It transfers the files seamlessly without any restriction by iTunes. 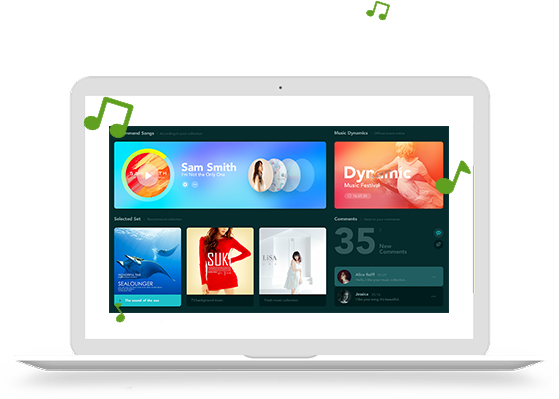 Manage Music, Videos, Photos, Apps - Manage all kinds of media files, including music, videos, playlists, photos, apps, etc without any hassles. Add files from Computer to iDevice Directly without Opening iTunes - iMyFone TunesMate is a better alternative to iTunes. Through this app, you can easily add files from your PC to iDevice without the need to open iTunes. It works flawlessly. Customize Ringtone from Any Songs - Experiencing difficulty in setting a song as your preferred ringtone on iPhone? iMyFone TunesMate can resolve this issue. Customize ringtone from any songs is easy. With Ringtone Maker on iMyFone TunesMate, you can set a song as ringtone anytime, any day. Rebuild iTunes library from iDevice - With iMyFone TunesMate, you can rebuild iTunes library from iDevice.The app serves as a database which has various kinds of media files you've added to iTunes. 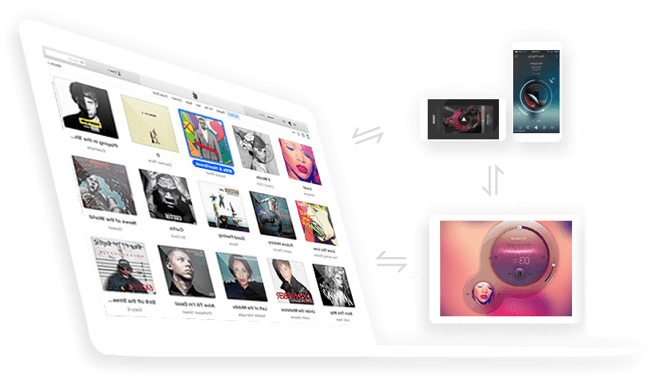 In a situation where the iTunes got corrupted or you lose the entire iTunes library, iMyFone TunesMate offers you the opportunity to rebuild your iTunes library from iDevice. Extract iTunes library without iTunes Password - With iMyFone TunesMate, It's easy to access and extract iTunes library without any iTunes password. This can be achieved with a Single click. Sync without Erasing Your Previous Data - Synchronizing with iTunes will erase your previous data. 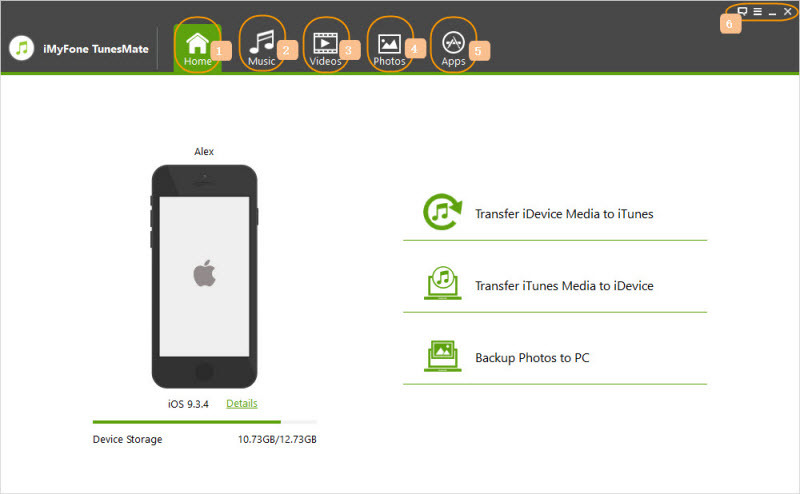 iMyFone TunesMate is an easy fast and safe way to synchronize your files without erasing the previous data. 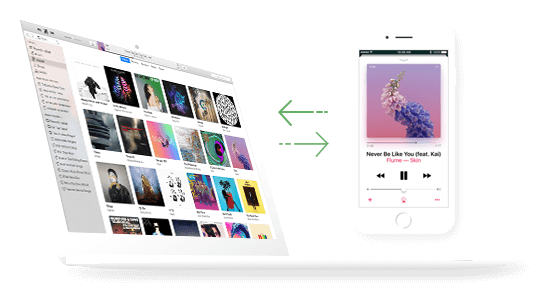 Both Purchased and Non-purchased Items Can Be Transferred - iOS users transfer music from their iPhone or iPod when there is need to use their favorite song for personal purpose or backup reasons. Even though iTunes has the capability to execute this task quickly, it limits users when it comes to transferring purchased music. With iMyFone TunesMate, you can transfer both purchased and non-purchased items. iMyFone Umate Pro is fully compatible with iOS 11 and receive lots of positive reviews from Getintopc, Geekreply, tricksworldzz.com, etc. How to Save Text Messages/iMessages from iPhone to Mac?